As a community not-for-profit organisation we offer a number of our services for FREE to charities and community projects. MKFM has promoted over 1000 events since our launch in 2011. 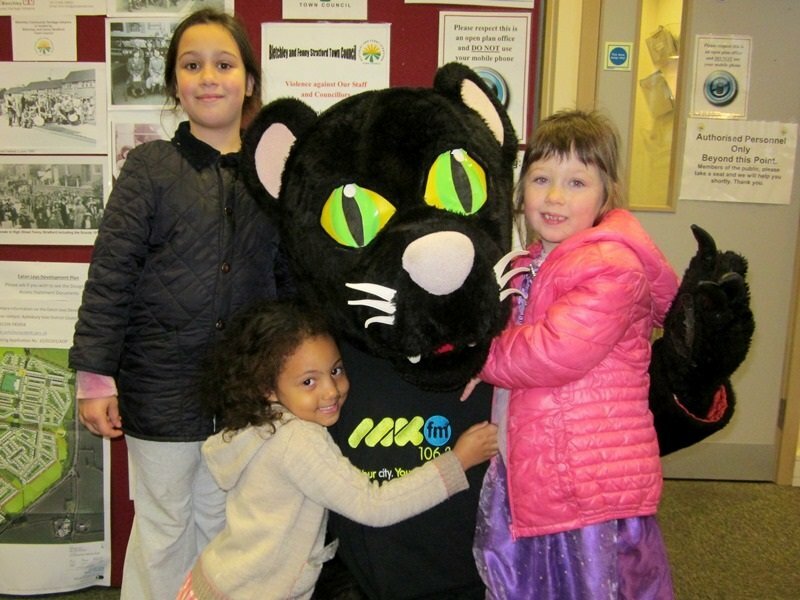 Our street team is famous and has even been mentioned in the House of Commons for attending over 500 events with our mascot Samantha the Panther. We are dedicated to helping promote local events for everyone including commercial organisations and good causes, and we attend events every weekend but there are so many events which take place it's impossible for us to cover them all. However, if you're a commercial organisation or would like guaranteed exposure we have a number of packages available. All proceeds from our packages support us as your dedicated local radio station for MK. We can promote your event through our website, our social media pages that reaches around 200,000 people each week and through our broadcasts on DAB Digital Radio and on FM. Looking for how to get our fantastic MKFM Bus, Sound System or Megaslide at your event? Check out all the details here. If you'd like to book one of these packages or discuss a number of bespoke options, we would be pleased to hear from you - please email sales@mkfm.com. If you would like to apply for some free coverage, you can submit your event to our events calendar and then let us know if you would like us to try to attend by emailing events@mkfm.com. Make your event unique with our amazing convertible bus, bouncy megaslide and our line-up of fantastic DJs. As well as promoting your event, we have a range of additional services to help make your event a success. Each event is different and we would love to come up with something bespoke to suit your requirements. This page however gives you an idea of what we can offer your business or organisation - and remember all proceeds from our packages support MKFM's community work! Looking for details of how we can promote your event before it happens on air, online or on social media? Check out our MKFM Events advertising page or just give us a call on 01908 230149! Our convertible bus made its first appearance at the Christmas light switch-on at intu Milton Keynes in 2014. The MKFM Bus can be used as the centre piece of your event and includes a PA system and host to deliver messages throughout your event. There are a number of additional options including our DJ's attending your events as well as an extensive range of local artists who can perform either on top of the bus or on the bus drawbridge. Please contact us for a bespoke quote - call 01908 230149 or email sales@mkfm.com.